Welcoming a new baby can be both an exciting and challenging time for your older children. Today, we’re talking about a few easy and playful ways to combat jealousy! Read on for some must-know parenting tips! There isn’t much that is more exciting than bringing home a new baby. That is, until you’re a couple of days in, and your older child realizes that the baby is here to stay. Dealing with older child jealousy is a big concern when a new baby comes home, as sharing Mom and Dad with another little human is not easy for a toddler to understand. Preparation is key, and the more you can be prepared for the jealousy monster before it arrives, the better off you’ll be. Give these simple tips a try to combat jealousy toward the new baby. Practice and prepare! If you’re still expecting, take advantage of this time to prepare your older child as much as possible. Give him or her a baby doll and work together to diaper and feed the baby. Read books like Baby Dear and Kid’s Book to Welcoming a New Baby that explain what welcoming a baby will mean. Involve your older child. Once the baby arrives, involve your older child as much as possible. Ask them to get you diapers, help you feed the baby, help you “hold” the baby (while you closely supervise, of course), and anything else that makes your older child feel like they are part of the changes happening in your house. Set aside special time with each parent. Find one thing each day that your older child gets to do with each parent. Perhaps Dad does bath time with the older child while Mom feeds the baby, and then Mom reads a story while Dad cuddles the baby. Routine is important to help your older child know what to expect, and the one-on-one time is that much sweeter for all of you now that you’re being pulled in different directions. Schedule a special outing with another favorite adult. Making your older child feel special is the name of the game. Ask a grandparent, Godparent, or another loved adult to take your older child out to lunch, to the park, or another fun place. Make sure you mention that this is something your older child gets to do because they are a big kid! Be understanding. Your older child is going to have waves of emotion that they cannot name. Losing it because you picked out the wrong pajamas is probably related to the new baby. As hard as it is when you’re exhausted, try to remain calm and be understanding when your older child becomes emotional and irrational. The wave will pass much more quickly if you respond calmly and quietly. Go on an outing just the three of you. Once the baby is taking a bottle, leave him or her for a couple of hours with a grandparent or another trusted adult, and go on an outing with just Mom, Dad, and your older child. My daughter turned 2 just 5 weeks after her brother was born, and when we took her to Build-a-Bear and lunch for her birthday, her brother stayed home with a close family friend. We wanted her to feel special on her day, and honestly, my husband and I missed time with just her. It was as beneficial for us as it was for her! Implement a “Big Kid” sticker chart. If you have yet to involve your child in chores around the house, now’s the time. Choose items you know your child can successfully complete like straightening his or her room and feeding the dog, and make a sticker chart together. Decide what reward your child is working toward, and each day, as you add a sticker, remind your older child that the baby isn’t old enough yet to be able to help around the house and earn a reward. Before long, your older child will learn that the baby is part of his or her new normal. Once the baby is a few months old and starts to interact a little more, your older child will realize that this little person is becoming a playmate. It won’t be long before they are running around together driving you crazy! Do you have any other parenting tips to combat jealousy when you’re welcoming a new baby into the family? Share below so we can all learn from each other! Interesting strategies. Empowering the older child sounds like a good technique, as it could make them feel special. Great tips! I have five kids and we never had any jealousy fortunately! Mine were all too old or way too young to ever feel that kind of emotion! I definitely agree with everything that you mentioned here. It’s really nice have the older sibling involved in every way. Also, a one on one time with each of them is vital. A lot of people don’t even think about that. My brother and I struggled with this as kids. My sister just had to deal with a jealous kid and a new baby. This post really hit home for me in that regard. Making sure the older kid gets plenty of time with both parents is so important. It really helps them not to get too jealous. My kids are 4 and 6 and they have jealousy of each other occasionally. These are great ways to combat it!! My daughter had a new baby six months ago and I’m supprised my grandson isnt jealous. He loves her to bits. My kids are 8 and 6 and still deal with that jealousy. But I’ve made deals with each child that reward them and give them individual time with both their parents. We also did a big brother toy when our littlest was born. It helped a little. I think the tip to set aside time for the older child was so important for us. My kid needed that one on one time since everyone seemed so focused on the twins. We didn’t want our other child feeling left out. I’m in total agreement, my kids are 7 years apart. I had to do all of these things to get my son ready. I got him in a new sport where we only focused and celebrated him so the attention wasn’t always on the baby. These are all such great ideas. My kids are 5 years apart and my son always wanted to include the baby no matter what we did. My husband and I don’t have children but can see how this article would be helpful to parents. I especially love the idea of making sure the older child still gets some special time with the parents. My husband and I don’t have children but I think this article is going to be very helpful for many parents. I especially love the idea of making sure the older child still has special time with the parents. These sound like great ways to help the older child feel special. My girls were 6 years apart, so I didn’t have to combat jealousy too much. Because the baby usually napped every afternoon when she came home from school, we were able to have some one on one time. These are good ways to make the older child feel more special. We always had some special toys we kept aside for our older child, like beads or something that couldn’t be around the baby, and were reserved for special time. 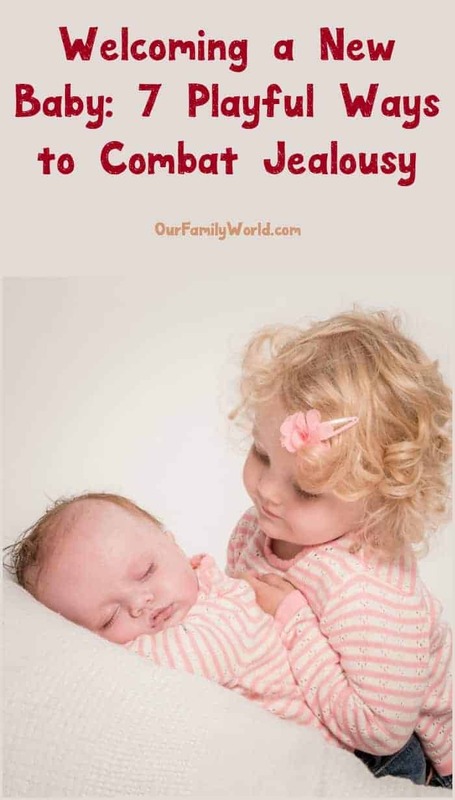 On point with all the tips on how to over come jealousy with a new baby in the home. I was ver lucky and never experienced this with any of the children. It’s really important to involve the older child when it comes to welcoming a new baby. These tips are perfect for parents who are expecting another child! These are some great tips! When we had our daughter, I always tried to make our son feel special. Even now I’ll take them out for one on one time. I think that’s important. Siblings don’t always want to be together after all. These sound like good suggestions. I know a couple of people that bring a little gift for the older child when a baby is born as well.